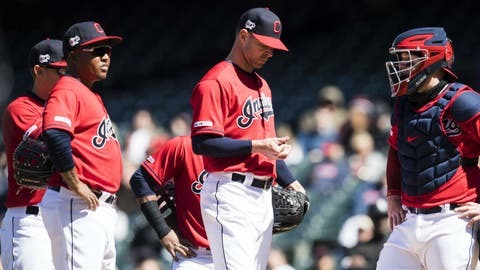 CLEVELAND (AP) — Jose Abreu drove in three runs, Leury Garcia had four hits and the Chicago White Sox knocked around Corey Kluber for a change, beating Cleveland’s ace and the Indians 8-3 on Wednesday. Abreu’s two-run double in the fourth inning chased Kluber (0-2), who had won nine straight decisions over Chicago. The two-time Cy Young winner has owned the White Sox, going 4-0 against them last season and 13-4 in his career. But starting with Garcia’s single on the game’s first pitch, Kluber was in trouble and lasted only 3 1-3 innings while losing to Chicago for the first time since July 24, 2015. Kluber didn’t get his second loss in 2018 until his eighth start. At about the same time they were scoring three times off Kluber in the first, the White Sox announced that Thursday’s home opener against Seattle is being pushed back to Friday because of a nasty weather forecast in Chicago. Two innings later, it was manager Terry Francona’s turn and he took the ball from Kluber, who allowed just three runs in 28 innings against the White Sox last season. Chicago added another run in the second on Abreu’s RBI single. The White Sox went up 6-1 in the fourth when Garcia singled, Moncada doubled off the wall in center and Abreu delivered his two-run double over right fielder Jordan Luplow’s head.